Living life on the events circuit has taken staging specialists, Olly Watts and Jeff Burke, on a tour of some of the world’s most spectacular occasions. But, when they wanted to organise a management buyout, internationally-renowned ES Global (ESG) – which has staged events from Live Aid to the London Olympics – faced some major hurdles. Thankfully, having pensions helped get them over the line. The decision to buy out the company where they had worked for 15 plus years, when their fellow directors decided to hand over the reins, required a large amount of due diligence, confidence in the company’s brand and a solid tranche of finance. However, with a funding requirement of several million pounds, Olly and Jeff needed some serious financial support. In fact, the ES Global brand has an international stage – literally. Some of the largest event structures, including the legendary Live Aid Wembley stage in 1985, the Chanel Mobile Art tour and, most recently, structures at the 2012 London Olympics and 2014 Winter Olympics in Sochi, have all been designed and built by the company. The pension scheme bought and leased-back the highly valuable ESG trademark and, using this to top up the bank funding, Jeff and Olly became the proud owners of ES Global. Equally importantly, with the SSAS funding being paid back directly into the scheme at a healthy interest rate, their business is also boosting their pension. The two owners have already seen a healthy growth in the business. With 22 staff and a new storage facility in Nottingham to complement their East London headquarters, turnover more than doubled in 2013/14 from £3.5m to £8m and 2014/15 should see a further 50 per cent increase. According to Jeff, the ES Global team has a clear vision: “We want to be running a very successful, profitable, well-organised business with clear value.” While there is little doubt they are already on track to achieve this, ironically, Jeff and Olly rarely get to see the fruits of their labour: “We’re at the events for at least a year in advance, often more, and then back again to break it all down, but we don’t often see our structures in action,” says Jeff. But one thing is certain – they do see a very clear return on their pension investment. 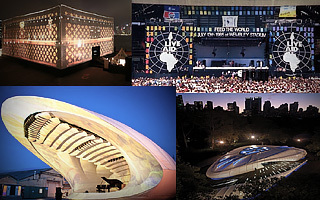 From Live Aid to the 2012 Olympics, ES Global has provided temporary structures for events and exhibitions across the world since 1974, using its patented construction system. Directors Olly Watts and Jeff Burke wanted to implement a management buyout. While Coutts bank could partly assist, they required further finance from complimentary funding. A new SSAS was set up for Olly and Jeff and money from their pension funds was used to buy the ESG trademark, valued at £405,000, which the company is leasing back, benefitting the business and pension. Olly and Jeff now own the company they helped build into a world leader. They continue to build fantastic structures for clients across the world, from Formula 1 to Chanel and are exploring other financial services with Clifton.